Daimler AG has forged a significant alliance with Chinese manufacturer and battery giant BYD (build your dreams) that will give the German luxury car-maker a toehold with electric vehicles in the world’s biggest marketplace. Daimler and the Chinese BYD have signed a contract in Beijing which creates a 50:50 research and technology joint venture - Shenzhen BYD Daimler New Technology Co Ltd - that will develop an EV for China. BYD is backed by American billionaire Warren Buffet, and will supply battery technology and electric drive systems for use on Daimler platform architecture - as seen on its Mercedes-Benz A-class and Smart ForTwo - to create the first model in a new, as yet unnamed, brand of electric vehicles to be sold in China. Daimler and BYD will jointly invest RMB 600 million (3.1 billion THB) to use as registered capital for the joint venture, which is still subject to Chinese government approval. Daimler chairman Dieter Zetsche said the joint venture was well positioned to make the most of the vast potential of electric mobility in China. “We are fortunate to have excellent joint venture partners in China and the establishment of this research and technology centre with BYD adds another dimension to our growing presence in this important market,” he said. BYD already has plans to begin selling its own cars in Europe next year, with right-hand drive markets, including Australia and the UK, set to follow in 2012. Thailand is part of the RHD market, but it would be unlikely that they would bring these vehicles in here, with our customs duty and excise. Other BYD models on the horizon are the e6 full-electric people-mover unveiled at the Detroit motor show in January (and now in production in China), and a number of more established models including the F0 micro, F3/F3R light sedan/hatch, G3 small sedan, F6 medium sedan, and the F3DM and F6DM plug-in hybrids. Daimler set up a joint venture in 2008 with Evonik Industries AG to build lithium-ion battery packs. It also holds a 10 percent stake in the American Tesla Motors, which builds electric sports cars and supplies batteries for the Smart EV. Last week I mentioned that red quarters on a BMW radiator badge denoted what car? This was after the division of BMW following WWII. The Eisenach factory ended up in East Germany, the Soviet side, and continued to produce the pre-war BMW six cylinder models, initially called ‘Autowelo’, and then EMW. The radiator badge color was changed in 1951. Incidentally, the Vietnamese police were using EMW motorcycle and sidecar outfits for many years. So to this week. Which helicopter factory became one of the most significant makes in motorcycle racing? Clue: it was owned by an Italian Count. Some examples of the noble black art in auto electrics. Remember the fuel pump on the original Mini’s, made by Lucas, otherwise known as the Prince of Darkness. In a fit of madness, Sir Alec Issigonis decided to put the fuel pump under the floor of the boot. I personally think he forgot about it during the design phase, and the pump and its subsequent placement was an afterthought after the engine wouldn’t fire. Oops! No petrol. Oops! No pump. I had another method, which did not require you to stop at the side of the road or unscrew anything. I used to keep a short iron bar down beside the driver’s seat and when the pump stopped pumping, I would lean out with the bar in my hand and beat buggery out of the pump. It would start again, either because I had made the points open and close, or because the pump was so frightened it was trembling. To make it easy, the sides were off the bonnet (‘de rigeur’ in those days, complete with leather straps across the top bonnet panels). Another bit of engineering that defies physical laws lies in the universal joints in the propeller shaft. A kind of metal X with case-hardened caps filled with rollers. Despite all the greasing in the world, these things would always seize up, and you had to pull it all apart. The owners manual made it look easy. (Those were the days when the manufacturer actually allowed you to touch the car. These days your warranty would become null and void and you would probably be subjected to some kind of exquisite electro-torture.) But back to the manual, complete with some chap in a dust coat. “Tap the yoke lightly and the bearing will appear” was what the good book said. Not one solitary word as what to do when the bearing didn’t appear - and they never did. The James Bond 1964 Aston Martin DB5 is apparently set to fetch more than $6 million when it goes to auction for the first time in its history. The second of only two ‘007’ versions of the famous sports car driven by actor Sean Connery in the ‘60s 007 films Goldfinger and Thunderball will go under the hammer in October in the UK. The DB5 comes equipped with all the original ‘Q’ gadgets and modifications seen in the movies, including the front-mounted machine guns, rear pop-up bulletproof shield, revolving number plates, oil-slick sprayer, smoke screen, tracking device, and, of course, the removable roof panel that allowed Bond to jettison his unwanted passenger from the Aston Martin’s ejector seat. Now how is this for inflation? An American radio broadcaster, Jerry Lee, bought the 1964 DB5 prototype from the Aston Martin factory for $12,000 in 1969. 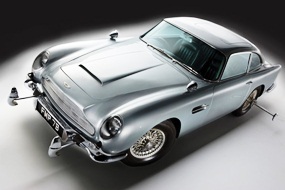 The first Bond DB5 sold in 2006 for US$2,090,000. The annual Isle of Man (IOM) TT’s are on again, and our motorcycling correspondent Alan Coates has been keeping me up to date. The top riders are averaging 130 mph (208 km/h) for the very tight and twisty 37.7 mile (60 km) road course around the island. In addition to the Super Bikes and Super Sports, there is also the TT Zero electric bike race again. These noiseless electric bikes look like breaking the magic 100 mph (160 km/h) barrier this year and there is a STG 10,000 incentive for the first electric powered motorcycle to do this. This landmark was achieved for the first time by a conventional bike in 1957, when Scotsman Bob McIntyre lapped the TT Course in 22 minutes 24.4 seconds for an overall average of 101.03 mph. Rob Barber and Team Agni recorded a fastest electric lap time of 25 minutes 53.5 seconds (87.434 mph) in the 2009 clean emissions race.